Apple has decided that like Siri, AirPlay will be a marketing ploy that attempts to get users to upgrade their hardware. AirPlay is the ability of an Apple device to mirror video output to a screen attached to an Apple TV. this is valuable to business professionals as an unteathered means of presenting from a computer or to end users wishing to watch movies or share photos on “the big screen from a laptop, iPhone or iPad. Last year Apple used the personal assistant software package “Siri” as a reason to push customers with iPhone 3GS and iPhone 4 devices to upgrade their phones even though the older phones were more than capable of running the software. This was the first move of its kind from Apple who previously had offered major hardware advantages as the primary reason to upgrade. This new method of pushing users to purchase new hardware is carried forward in the new Mountain Lion operating system. So what can one do? This planned obsolescence, like the previous example with Siri is not really due to hardware. I mean, if an iPad or an iPhone can do it, A MacBook Pro from 2010 could do it with its eyes closed. As we said above, this is not a play on system resources so much as a play on revenue. Also, as this feature is touted all over the Apple website but only after reading the details of the new feature half way down the page will you see the information about how AirPlay is limited. This program costs $10.00 and adds the same functionality that Apple claims your MacBook Pro is incapable of. AirParrot is a well-tested peice of software that is “Liked by almost 2000 Facebook users. They are very active on Twitter and based on our research their staff answers customer questions faster than Apple’s own support group. 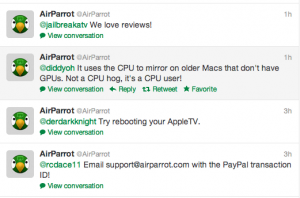 So if you are one of the people who was left feeling like Apple is rotten to the core, try AirParrot and feel good about your MacBook Pro all over again! AirParrot is not paying me to say any of the above. 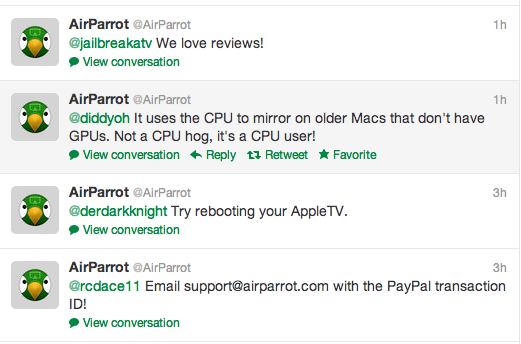 I am a paying customer of AirParrot. 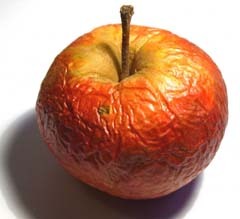 I AM a jaded, Apple fanboy who is tired of spending thousands of dollars every 12-24 months to keep up with apples marketing related limitations. When an AirPlay enabled device is available, you should see AirPlay options in Control Center on your iOS device.